Legal roots run deep at Carpenter & Carpenter. Jim Carpenter’s father, a decorated Army captain, was killed in action during World War II. Jim sought professional guidance from his two uncles who were both attorneys. 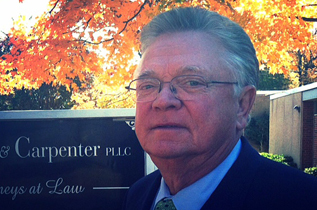 During law school, Jim served as a staff member for the North Carolina Law Review. After graduating from law school in 1969, Jim joined his Uncle Lewis as an associate at a venerable law firm in Charlotte, NC where he focused on insurance defense. In 1972, Jim crossed the Catawba River into Gaston County to work with the legendary Pat Cooke. Here, he honed his skills as a fierce but fair litigator. Jim has tried hundreds of jury trials, both civil and criminal. He has helped people and businesses through crisis situations. In family law, Jim has successfully handled thousands of cases involving child custody, alimony and equitable distribution. With 44 years of legal experience, Jim brings a wealth of knowledge to any case. In his free time, Jim loves to play golf, trumpet and guitar. He sings in the choir at All Saints Episcopal Church and serves on the Board of Directors at the Gaston Country Club. 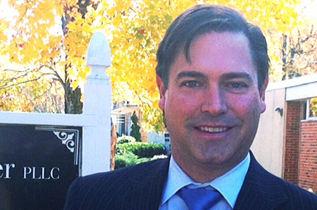 Wade Carpenter, first worked as a commodities broker before attending law school. During law school, he served as a staff writer for the North Carolina Journal of International Law and Commercial Regulation. In 2001, Wade returned home to join his father’s law practice. Soon after his return, the father and son team formed Carpenter & Carpenter. Like Jim, Wade fights hard for his clients. He has won a number of civil and criminal jury trials. In family law, he represented parents and grandparents who won custody of their children and grandchildren. In administrative law, Wade has guided law enforcement officers facing termination proceedings as well as employees fighting for unemployment benefits. He often takes on difficult, complex cases that many attorneys turn down. With 12 years of legal experience and his father’s guidance, Wade is a zealous advocate who understands people as well as the law. Wade is the past President of the Gaston County Bar Association. He serves on the Board of Directors at the Life Enrichment Center and is on the Advisory Board for Legal Aid. In his free time, Wade loves to cook, fish and travel. He also enjoys photography and hiking.